It’s August, which means it’s back-to-school season. 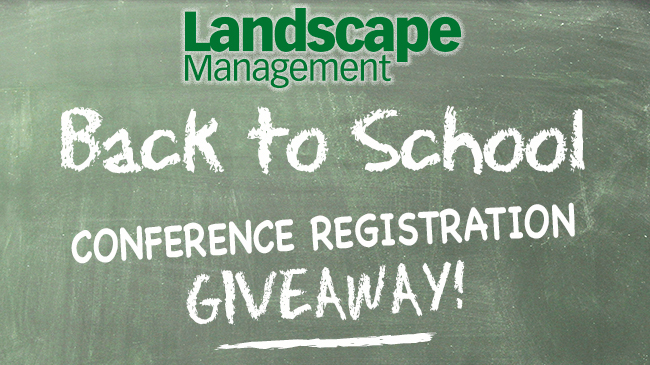 We’re hoping landscape and irrigation contractors have education on their minds as much as school kids do because we have a great offer for Landscape Management readers. In collaboration with the Professional Landcare Network and the Irrigation Association, we’re offering five free registrations to both the Green Industry Conference (Oct. 23-25 in Louisville, Ky.) and the Irrigation Show & Conference (Nov. 4-8 in Austin, Texas). That’s 10 lucky winners. Each of these prizes is valued between $249 and $465, depending on a winner’s association membership status. So, if you’ve never gone to one of these conferences before, a free ride may be reason enough. Or, if you go every year, you just may save yourself a chunk of change. To enter the giveaways, complete the details in the entry boxes below now through Aug. 31. Readers are welcome to enter either or both giveaways. Winners will be notified the first week of September.